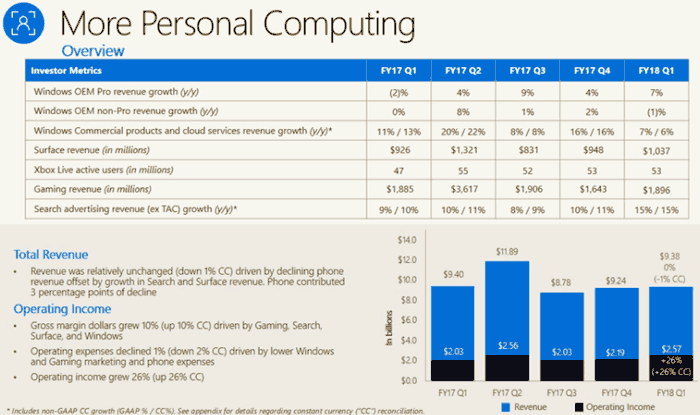 Microsoft has just published its latest set of quarterly financial results. The key figures from the quarter (referred to as FY18 Q1) are revenue of $24.5 billion, up 12 per cent, and operating income of $7.7 billion, up 15 per cent. 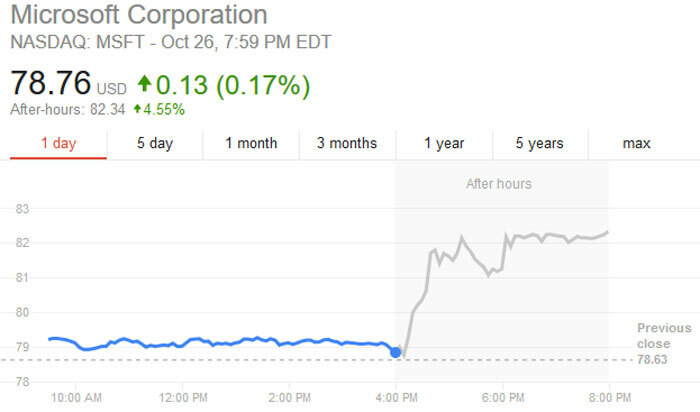 “Our strong start to the fiscal year reflects the impact of our continued investment in product innovation and sales capacity to capture expanding market opportunities,” said Amy Hood, executive vice president and chief financial officer at Microsoft. Microsoft operates three business segments and the star of the show was Productivity and Business Processes – its revenue was $8.2 billion, up 28 per cent. This segment contains Office commercial products and cloud services (up 42 per cent), Office consumer products and cloud services (up 12 per cent), Dynamics products and cloud services (up 13 per cent) and the LinkedIn business which contributed $1.1 billion in revenue. As revealed in the earnings call presentation slides, Microsoft's Office 365 commercial business was a major power behind the cloud results. Business users of this subscription software grew to 120 million from 100 million in April 2017. Interestingly Microsoft revealed that 96 per cent of US Fortune 500 companies rely upon at least one of its cloud offerings. Office 365 for consumers active users also increased: from 27 million in the previous quarter to 28 million now. The Intelligent Cloud segment also provided good revenue growth, overall 14 per cent to $6.9 billion, with impressive growth driven by Azure. 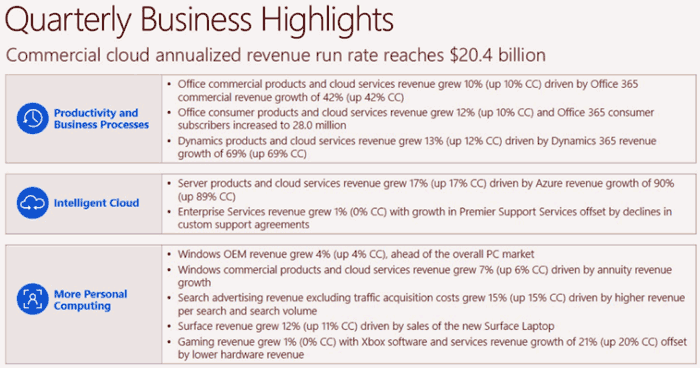 Server products and cloud services revenue increased 17 per cent and Enterprise Services revenue increased 1 per cent. After digesting the highlights directly above you might wonder why the segment was so flat overall. It’s exactly because those bullet points are 'highlights'. For example, a lowlight was the continued drag of the Windows Phone business with revenue down a further $315 million this quarter, contributing 3 percentage points of decline. An industry analyst talking to Reuters in the wake of the latest results tipped Microsoft for growth and summed up a favourable outlook as follows; “A slowly improving PC environment is also a modest tailwind for Microsoft with cloud remaining the Trojan horse growth driver for Redmond over the coming years.” At the time of writing Microsoft shares were up 4.5 per cent in afterhours trading.